As you know, I finally finished my spice rack project. 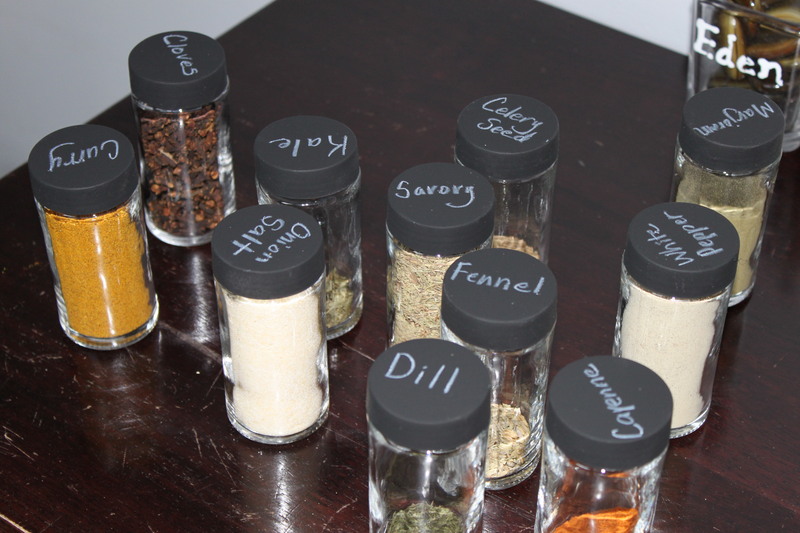 If you were looking at the pictures from the post carefully, you probably noticed that my spice bottles don’t match. I had upcycled some old ones from an old spinning spice rack, but those that were still hidden in the spice drawer were left in their original bottles. I put the mismatched bottles on the new shelf, but picked up some clear spice bottles with white lids at the dollar store. These bottles were only 3 for a dollar. I decided to buy a dozen and then see how many more I needed. (Had I thought of it, I would have counted before I left, but I actually went to purchase baking soda and peroxide for my weekend cleaning frenzy.) 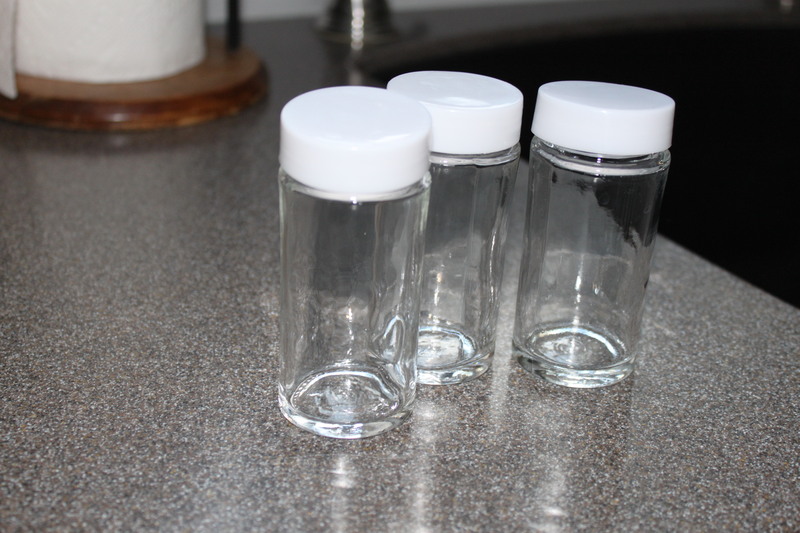 I put the bottles through the dishwasher and hand washed the lids and plastic pieces (with the holes for sprinkling). Once they were thoroughly dried, I spray painted them with black paint and printed the spice names on the lids with white Crayola twistable crayon. Here is the original post with the tutorial. I really love the crayon in lieu of chalk. It gives the same effect, but you don’t have to worry about smearing. If you remember, I have chalkboard labels on my glass pickle jar canisters and the chalk is always smearing. I think I might actually erase them all and convert the printing to crayon. Not my idea, but certainly a great one!! Here are the completed bottles! Posted on May 8, 2014 by Cindy Roy •	This entry was posted in DIY and Upcycling, Life Hacks and tagged chalkboard spices, dollar store hack, dollar store hacks, dollar store upcycle, how to get the chalkboard look without smearing, no smear chalk, spice bottle make over, upcycled spice bottles. Bookmark the permalink. Looks great Cindy/ Good job.